Rope Access In London Ltd (R.A.I.L. Ltd) is one of Londons most prominent professional abseiling companies, a CHAS accredited Level 3 Gold Construction Line member, we offer a comprehensive range of services that deal with all aspects of building work at height, operating from ropes we negate the use of expensive scaffolding and can access areas & heights where scaffolding is not an option. Individuals, private companies and government departments across the UK can benefit from our full range of abseiling services supplied by the most qualified rope access specialists in the country. We have extensive experience with all types of stone, concrete & brickwork, steam & chemical cleaning techniques, concrete, stone & mortar repairs, cladding removal & installation and we have done all of this work without a single accident. Our fifty-person team has highly skilled painters, glazers, roofers’ concrete specialists and we install and repair windows as well as clean them. 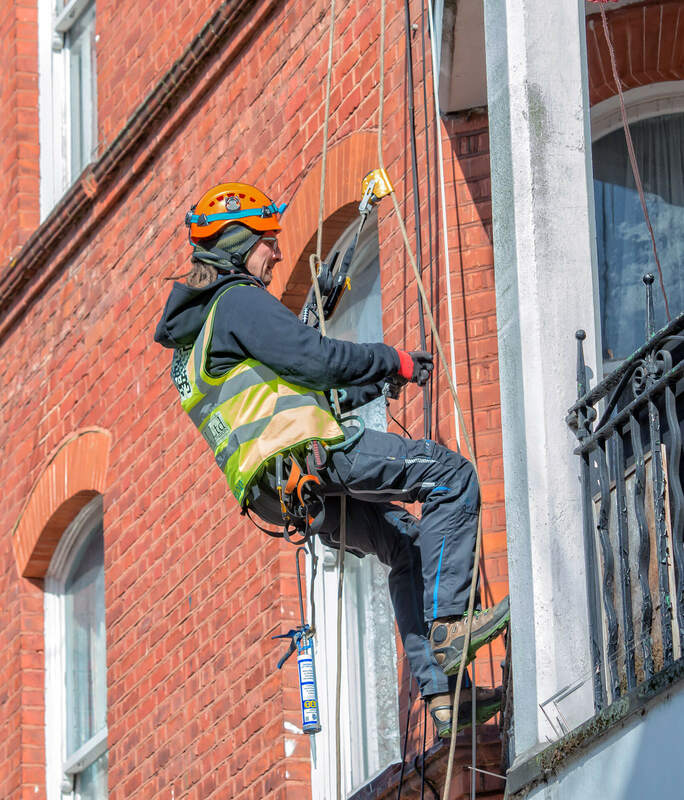 Rope Access In London has rapidly expanded since our formation in 2015 successfully completing over 3500 jobs & projects including the removal of flammable cladding from the five tower blocks on the Chalcots Estate using abseilers and have maintained high levels of safety and client satisfaction, amongst our clients are major companies such as Wates Living Space, Wates Construction, Kier & Morgan Sindall and local authorities such as Westminster, City of London, Camden, Kensington & Chelsea and Brent. All of our technicians are trained in accordance with the international standards as codified by the Industrial Rope Access Trade Association (IRATA). Whether your building is in need of cleaning, painting, repair or any other improvements that require work at heights, we are just the company you need. With rope access cleaners, no window, roof or wall is too high to clean. Whether it’s a routine cleaning or removing graffiti, we can handle it. The rope access technicians at R.A.I.L. can perform painting tasks both simple and complex, including brickwork, masonry, window, and roof painting. Buildings deteriorate over time and often require repairs in hard to reach places. Our rope access technicians are well trained in handling all manner of repairs. Birds can become very disruptive if not repelled early enough. Make sure they don’t bother you with our bird spikes, mounted by our expert rope access technicians. 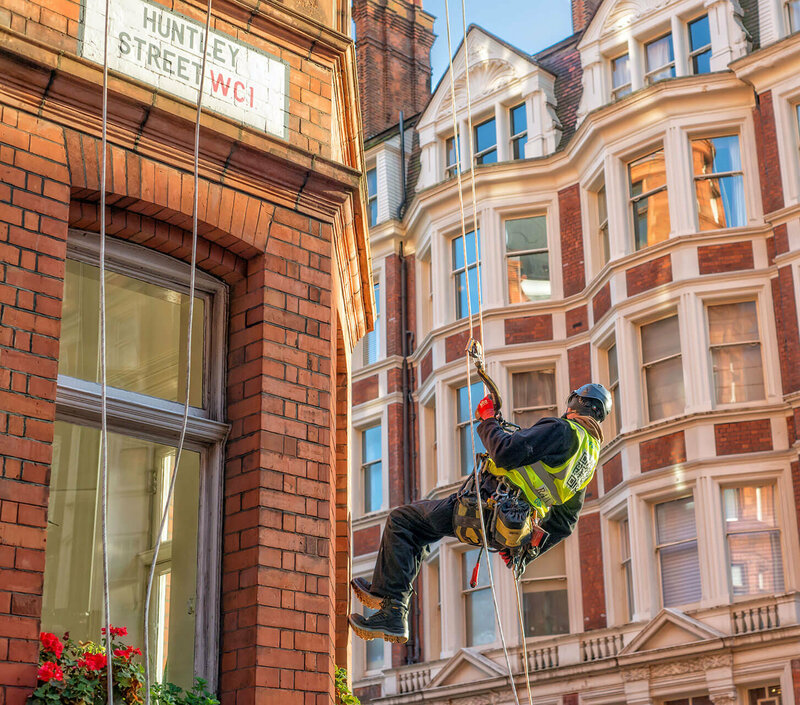 With their expert knowledge in the field, our rope access specialists can offer a number of building surveying services, such as drafting, photographic recording, and more. Make sure your building is protected from the elements from all sides. Our waterproofing service is here to help you make sure your roof and other higher elevations are always completely sealed. Our oﬃce building has never looked better! The technicians from Rope Access in London did a fantastic job, and they did it faster than I ever imagined! The building was in desperate need of cleaning for a while now, but we were too scared to try it on our own. Good thing R.A.I.L. handled matters so professionally! I thought the building would have to stay as dirty as it was, but it didn’t! With their high pressure cleaning devices, R.A.I.L. made the whole building look amazing again!